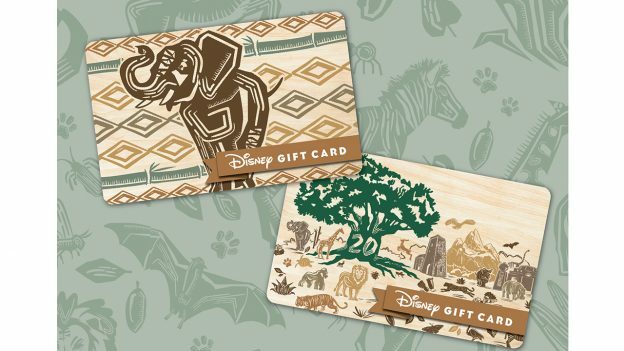 If you didn’t know already, Disney’s Animal Kingdom is approaching their 20th Anniversary, and now for the first time ever, Disney is offering gift cards made out of wood! You can choose between a landscape design that features spectacles of the park, like the Tree of Life which is the centerpiece for all anniversary merchandise, or you can choose one with an elephant like the ones you see on Kilimanjaro Safari! You can only buy these cards in Disney’s Animal Kingdom, so if you want one, be sure to visit a merchandise location starting this weekend during “Party for the Planet” and all throughout the year! And there may be an additional design that debuts later this year. In order to protect the card, there is no magnetic strip on the back of the card. There will be a barcode that the cast member will need to activate with a minimum of $15. After the card is activated, it functions like a normal Disney gift card. These gift cards are accepted all throughout the Walt Disney World Resort, Disneyland Resort, Disney Cruise Line, Disney Store locations, as well as shopdisney.com and the Shop Disney Parks app! These cards are reloadable in person and never expire. These are a great addition to your Disney gift card collection, so make sure to pick one up in honor of Disney’s Animal Kingdom!